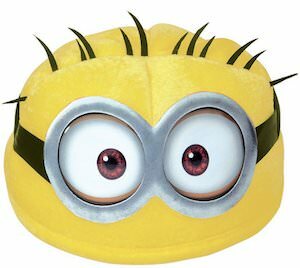 Now your kids are like Minions when ever this one thanks to this costume Minion hat. The hat is made for kids and will transform their heads into a two eyed Minion. The Minion hat is great as a party hat if you are planning a Minion themed party or you can wear the hat as part of a Halloween costume and you can dress up every day too. It is just an adorable hat that your kids are going to love and if you have more than one child then make sure you all get them this hat because other wise they will be fighting who can wear the cute costume hat. A real Curious George party of course needs hats. 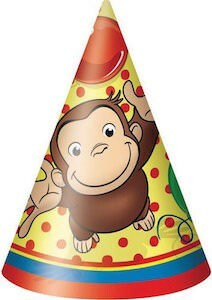 And you are in luck as we found these fun cone hats that have the funny monkey Curious George on it. The cone hats comes in a pack of 8 so that you can be done for the whole party at once. Just put a hat on each kids plate and maybe even hide a little treat under it and you all will be ready to party in no time at all. These cone hast are mainly yellow with red dots and yes of course George and balloons are on it to making it really a festive looking paper hat. Get ready to plan that party and lets start with these cute Curious George Cone Hats.